See the beautiful Jökulsárlón glacier lagoon lit up by multi-coloured fireworks on this fantastic day tour. Illuminated icebergs bathed in colours from the annual firework show, create an extraordinary experience that should not be missed by anyone visiting Iceland. Jökulsárlón is a beautiful lagoon located in the realm of Vatnajökull National Park. It is here where icebergs that have broken off the nearby Breiðamerkurjökull glacier float on the aquamarine lagoon before drifting off to sea. The Hornafjörður search and rescue association, Jökulsárlón boat trips and the Vatnajökull region regularly hold a firework display where they will illuminate the sky and the surrounding glaciers with red, green, blue and white colours. This tour, however, begins in Reykjavík, where you will be picked up in the morning and driven in a comfortable minibus across the country to the site of this fantastic show. You will travel along the South Coast and see some of the stunning sights which make this stretch of land so popular with both visitors and locals alike, such as the waterfalls Seljalandsfoss and Skógafoss, the glaciers Eyjafjallajökull and Mýrdalsjökull, the rock arch of Dyrhólaey, and Reynisfjara black sand beach. Once at the lagoon, you will be able to watch the icebergs on their journey towards the Atlantic Ocean before the excitement starts. At dusk, the firework display will commence, and the sky will be lit up in an amazing display of colour. 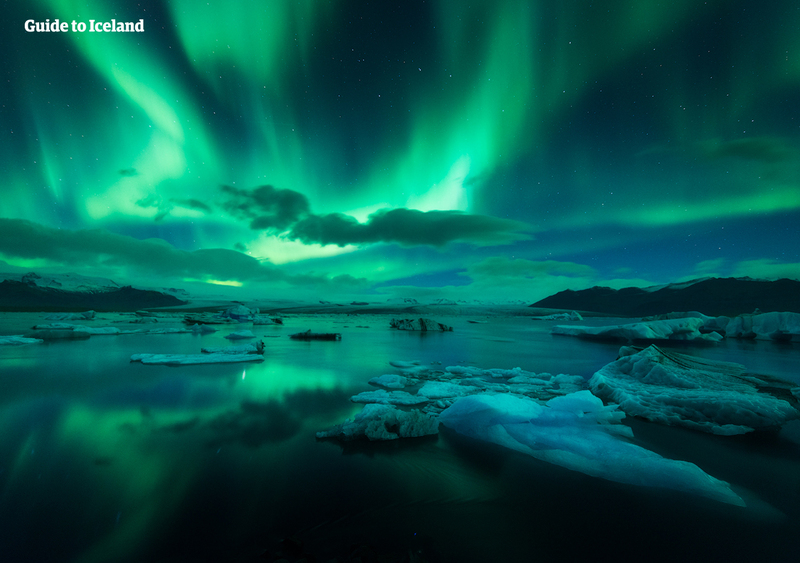 Don't miss out on this once-in-a-lifetime opportunity to see one of Iceland's most beautiful sights beneath an incredible firework display. Check availability by choosing a date. The firework display begins at 11 PM and will last around 30 minutes. Please note that you will arrive back in Reykjavík late in the night.